I believe this newspaper article from the Washington Daviess County Democrat (Indiana) on July 1, 1905 describes the violent mule kick suffered by my 1st cousin 3x removed, William Marion Arvin (1889-1960). 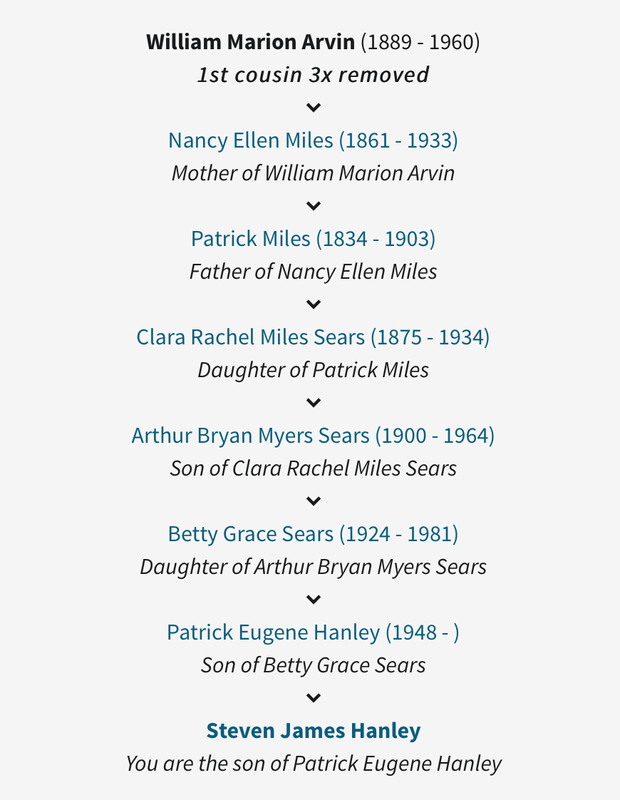 William is the son of my 3rd great aunt, Nancy Miles (1861-1933) and her husband, William Henry Arvin (1861-1947), who appears to go by his middle name, Henry, in this article. According to my records Nancy and Henry had four sons and four daughters. William was the only son who was 16 years old on the day of this accident, Sunday, June 25th, 1905. Here is a chart that breaks down the familial connection between William and myself. I wrote about William's grandfather (Nancy's father), Patrick, here: "Tall Man Dead" - Patrick Miles (1834-1903). I am about 80% confident that I have these details correct. Arvin seemed to be a popular name during this time period in these parts of Indiana, so there is a chance that my information is incorrect. As with most genealogy puzzles though, especially 100 plus year ones, I will take 80% any day of the week. I hope to bump that up to to 99% after I fill in some more gaps in my family tree. In fact, as soon as I am done writing this post I am going to send it to an ancestry.com member who has a fairly extensive Arvin line in his tree, including William and his father. This is the 33rd of 52 weekly posts planned for 2018. It was inspired by the #52Ancestors writing challenge issued by professional genealogist, Amy Crow Johnson. The challenge: once a week, for all 52 weeks of the year, write about a relative in your family tree.